Hello there! 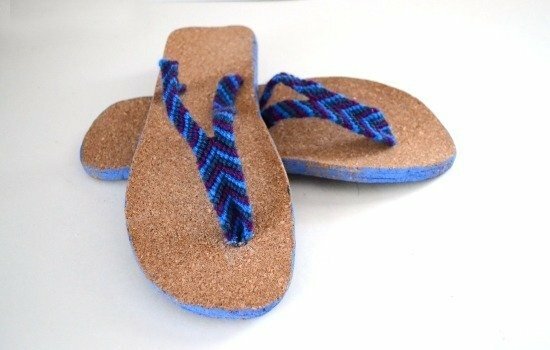 Now yesterday I showed you how to make cork soles for 100% homemade flip flops. 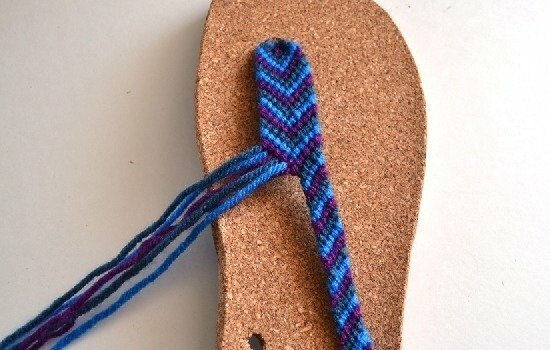 You can use those soles to make the friendship bracelet straps shown here, or Google DIY flip flops and find tutorials for other ways to get strappy. The day before I showed you how to make a chevron friendship bracelet – head back to that tutorial if you need a refresher on knotting. 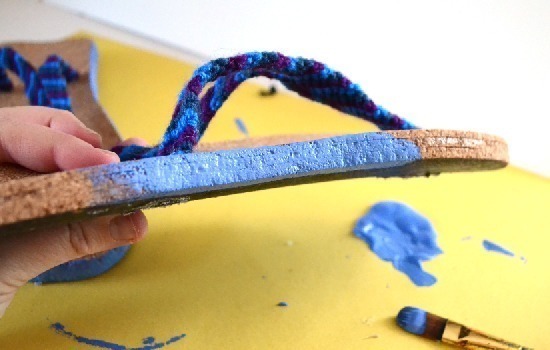 Now if you have no desire to make your own soles, never fear! 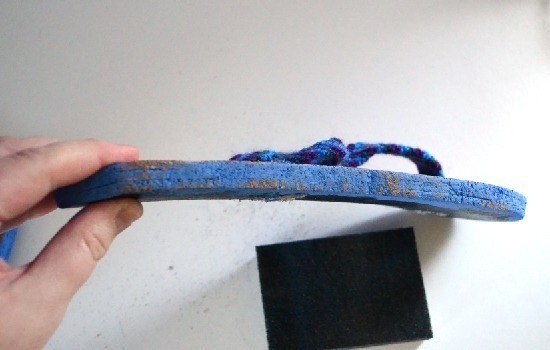 You can work these straps into a pair of purchased flip flops. Just remove the existing and continue on with the tutorial! Now we’re going to start making our straps. Take your yarn and cut long, 72 inch strips of each color. I chose 3 and I wouldn’t go above that (it will get really thick in between your toes if you do. 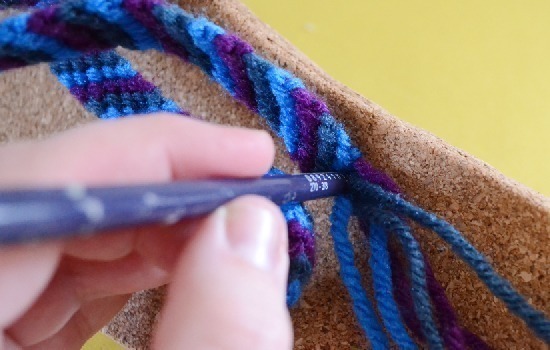 Loop the yarn at the mid point and shove through the hole you drilled near the toe portion. Knot the yarn so that it holds steady and doesn’t come up through the hole. 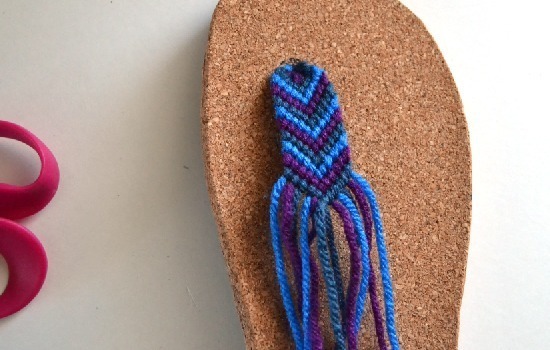 Flip that sucker over and start making a chevron friendship braid. Braid out for about 2-3 inches. Every once in a while put your foot on the flop and see if you you’re at the point that you want the straps to divide. Divide the yarn into the left section and right for each strap. 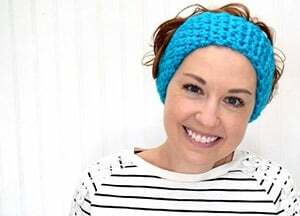 On the right continue your backward knots for several inches. I’d say 4-5. Take up the left side and continue your forward knots for several inches as well. When working on the next shoe, be sure to mimic the pattern and lengths you’ve already created on the other sandal. 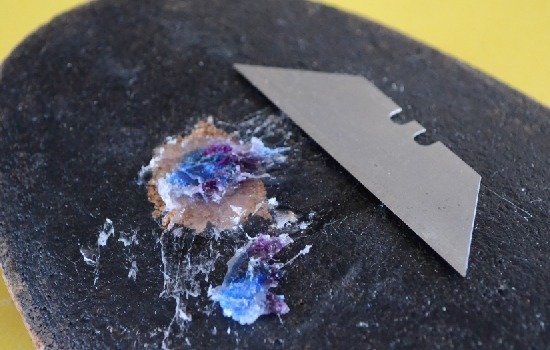 Take your razor blade or an X-acto knife and on the backside cut around the hole near to toe to make it larger. Don’t go all of the way through, just through the first layer of cork. 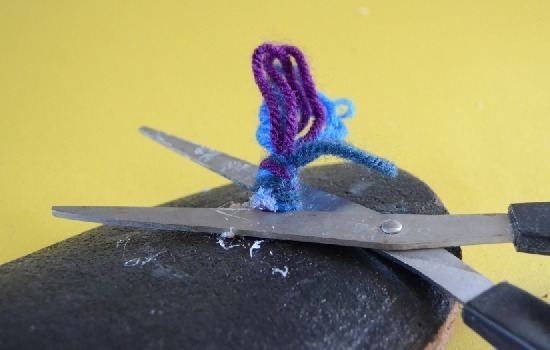 Take your hot glue gun and run glue all around the outside edge of the yarn just under your knot and shove into the hole you’ve created. Take your scissors and trim the knot off. You should have enough glue to hold it into place so don’t worry about it falling back through. 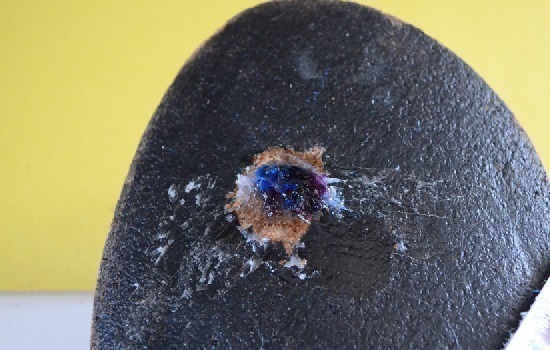 Now hot glue the heck out of that sucker. Don’t worry about it being bubbled up or whatnot, we’ll take care of that in just a bit. Notice how the yarn is kind of melted? Acrylic is plastic and will melt with the heat of the hot glue, FYI. Shove the straps into the back holes. You might need something pointy to help get it through (I used the end of a paintbrush). Put the flip flops on your feet and determine how tight you want the straps. Pull through underneath until you get a comfortable fit. Remember that friendship bracelets kind kind of have give or stretch (play with one and you’ll see what I mean). Keep this in mind and perhaps make the straps just a bit tighter than you would normally do. Glue the heck out of the straps just like you did the toe strap. Allow to cool fully. Take your razor blade and shave off the excess glue and whatnot, making the bottom as smooth as possible. To finish up, I painted around the outside of the soles with some bright blue paint. When dry, I hit them with my sandpaper block to distress them a bit. 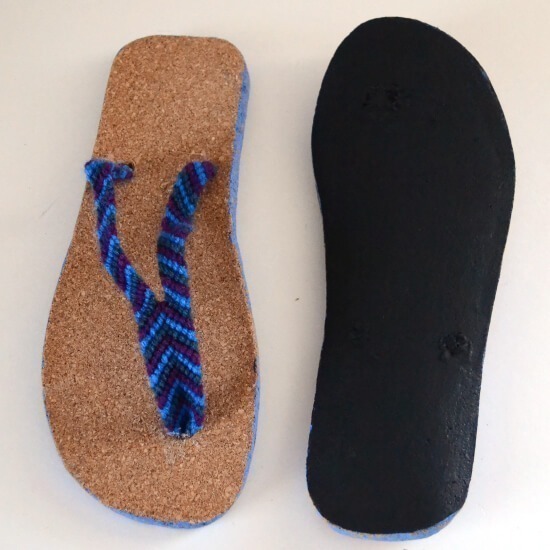 Lastly turn your flip flops over and hit them with one last coat of Plasti-Dip to cover up the unsightly yarn glue gob thing happening back there. And there you have them! 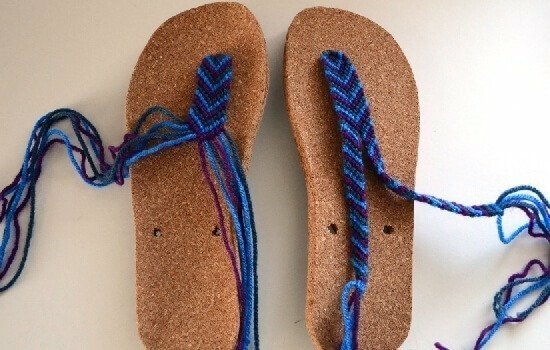 Homemade flip flops from beginning to end! Whew. Hope you enjoyed this post! Your crafting prowess knows no bounds! This is truly remarkable work…but really, I'm not surprised at all. Thanks, Lauren! I love the word prowess, by the way! You are so welcome, Onel. Thanks, Mid! 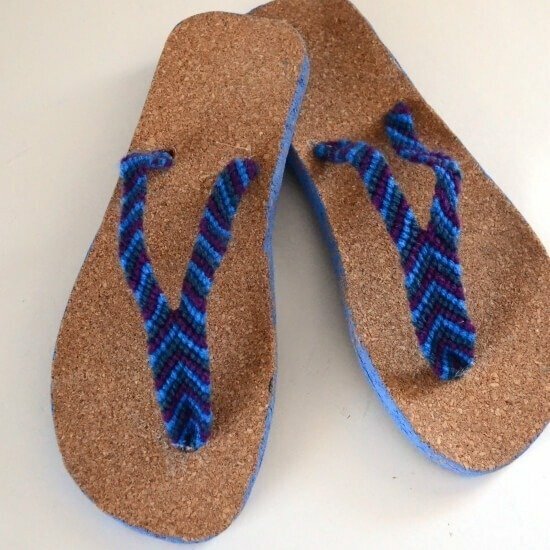 I've seen lots of flip flop things on Pinterest, too and I think that I'll be tackling some of them as well! Pretty cool. 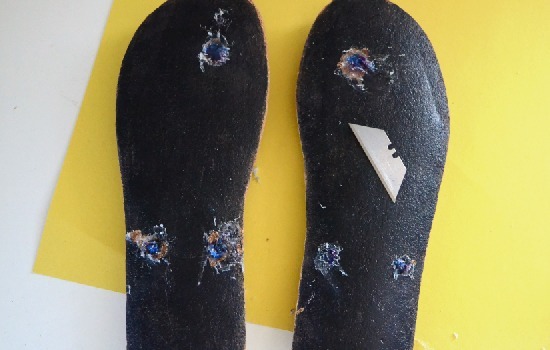 Have been thinking of resoling a favorite pair of sandals the same way, almost. I would wait to put the third layer of cork on after doing the strapping. That way it hides the strap ends and helps hold the straps at the same time. But that is the only thing I would think of changing. Your tutorial & pics are great! I think your method is definitely the way to go, Julie!! I love your tutorial. I have some cork laying around for a while, that's what i will be making. as i was reading it, tons of ideas came up, to personalize them. I have picky feet, so i need heels, that i'm planning to add, just cut another layer, the heel only and glue. I also liked the previous comment on making the strap first , adding it to the third layer, and then gluing it. and because i love jewelry and crochet, i will for sure crochet the top part,( i need to hide some nasty scars ) and add some bling with beads. Using a soft material for the crocheted top will surely be soft on my foot. I hope to send you pics once I make them. Just wanted to let you know that I absolutely *had* to put your totally DIYed flip flops into my season of flip flops roundup post for tomorrow. As always, I am in awe of your craftastic skills. No problem, Tess. You have a great day, too. 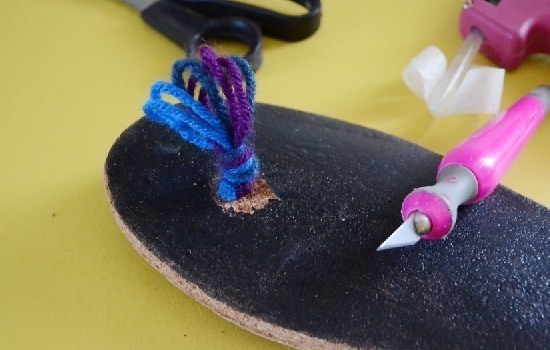 I’ve been looking hard for a diy sandal tutorial and this is spectacular. 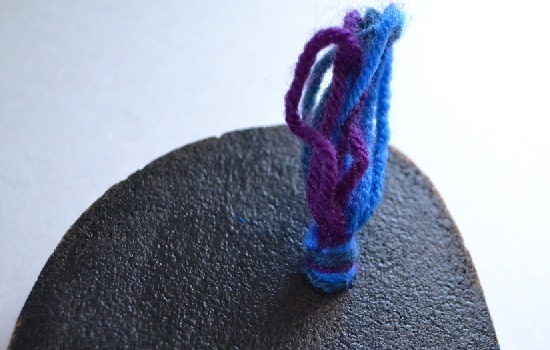 The braided twine soles ive seen look cool (sandrille?) but im not sure about wear and tear. How is your cork holding up? They held up for a good several months of light wear. At a point they got less bendy, maybe the sun dried them out. But they were fab while and totally worth the effort I think!